Start off your visit on the 17th (Wed): enjoy breathtaking views from Qutub Minar, take in nature's colorful creations at Humayun's Tomb, then contemplate the long history of India Gate, and finally examine the collection at National Museum. 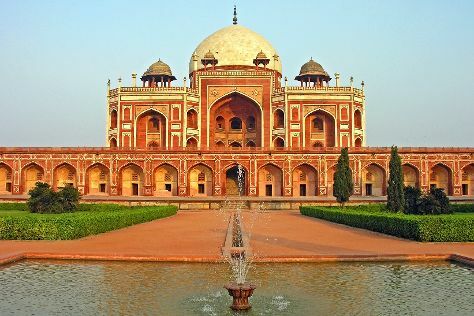 To find more things to do, traveler tips, reviews, and other tourist information, refer to the New Delhi sightseeing website . Use the Route module to find suitable travel options from your home destination to New Delhi. In April, plan for daily highs up to 43°C, and evening lows to 25°C. Finish your sightseeing early on the 17th (Wed) so you can travel to Rishikesh. On the 18th (Thu), take in the views from Ram Jhula, then let the river carry you with a rafting and tubing tour, then contemplate in the serene atmosphere at Triveni Ghat, and finally contemplate in the serene atmosphere at Triveni Ghat. To find reviews, other places to visit, traveler tips, and more tourist information, refer to the Rishikesh online tour planner . Traveling by flight from New Delhi to Rishikesh takes 2.5 hours. Alternatively, you can drive; or take a train. Finish your sightseeing early on the 18th (Thu) so you can drive to Haridwar. Start off your visit on the 19th (Fri): admire the natural beauty at Swami Vivekanand Park, then contemplate in the serene atmosphere at Har ki Pauri, and then take in the spiritual surroundings of Ganga Aarti at Haridwar. For reviews, other places to visit, where to stay, and tourist information, you can read our Haridwar online vacation builder . Haridwar is just a short distance from Rishikesh. Cap off your sightseeing on the 19th (Fri) early enough to go by car to Mussoorie. Kick off your visit on the 20th (Sat): stop by Cambridge Book Depot, then make a trip to Lal Tibba, then head outdoors with The Real Adventure Sports - Sky Walk, and finally take in the dramatic scenery at Kempty Falls. To find other places to visit and more tourist information, read Mussoorie driving holiday planning site . You can drive from Haridwar to Mussoorie in 1.5 hours. Alternatively, you can do a combination of bus and taxi. Wrap up your sightseeing on the 20th (Sat) early enough to travel back home.